The great national exhibitions are a good place to compare the different pouters breeds. Pouters differ in size and weight, the length/height proportions, in behavior and not least in the posture that make a significant difference in some otherwise very similar breeds. In the standards, these characteristics of a breed are postulated. Even breeds of the same size get by a different posture a very different and characteristic outlook, provided that the individuals shown comply with the standard requirements. And that does not always hold, unfortunately also not at the great shows. 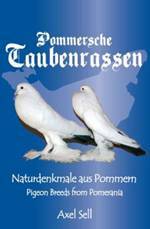 Those interested in the anatomical basics of domestic pigeons in general and also in pouters will have to take a look at the book by Dieter M. Fliedner (2012), 'The Artist's Guide to Pigeon Anatomy' (both in English and German language) with impressive photographic documentation of the skeletons of individuals of different breeds. A documentation of measurements published in literature in the past is given in the author's book 'Taubenfärbungen' in the introductory chapter (2015, pp. 14-26). • the spread of the specific pied marking in all three breeds. 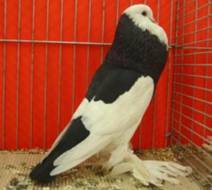 All three breeds have feathered feet, the English pouter very scarce, the other two breeds strongly developed muffs. 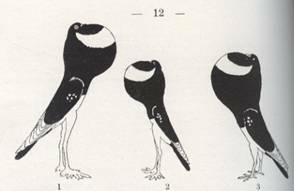 Important as a difference is the postures that was already shown in the author's book on pigeon breeds (Fig. 1). Fig. 1: Dutch, Pomeranian and English Pouters from the book 'Taubenrassen', 2009. The different stance is the most obvious difference between these pouters: Balanced the Dutch, the Pomeranian more upright, and erect with consistently sloping topline the English. For the Pomeranian pouter the stance in the standard is anchored (standing at an angle of 45-60 degrees) , and the Pomeranians shown on the shows usually have no problems with this requirement. A further difference between the breeds are the only medium long legs of the Dutch Pouter. Differences in leg length in some Pouters breeds is more apparent in the clean-legged as shown in Fig. 3 for the old German Pouter and the yellow Brunner. Fig. 3: Ghent Pouter with the Dominikaner pied marking, Old German Pouter in the middle and Brunner Pouter at the right (Taubenrassen, 2009). As a descendant of the Dutch Pouter the Ghent Pouter completes the group. The Ghent should have a balanced body in the back, but with erected front body. The correct formulation of the standard properties of the different breeds was a complicated and long lasting task end of the 19th and in the first decades of the 20th century to avoid an overlapping of different breeds that all reclaim their right. The historic pictures of Pomeranian pouters at the book by Prütz 1885, Lavalle and Lietze 1905 still show with the erect stance similarities at the former fashion breed, the English pouter, who for himself was a descendent of the old Dutch pouter. The overly upright stance also applies to photos of some Pomeranian Pouters that were shown all over the world on the Internet. Probably the main characteristics of breeds have not yet in all strains settled, and moreover also not in the mind of every fancier. Fig. 4: The process to find the own way between the different breeds. 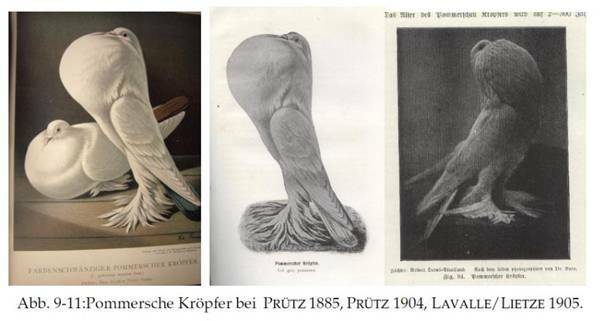 Here at the example of the Pomeranian Cropper about 1900 influenced by the then fashion breed, the English Pouter with extreme erect stance, from the book 'Pommersche Taubenrassen' 2010. In 1925 a painting demonstrating the characteristic of selected pouter breeds was published in the book edited by Wittig. At the left below an English Pounter, no. 5 a Ghent, no. 6 the then called Old-Dutch Pouter and no. 8 the Pomeraninan Pouter. The Pomeranian now not as erected as shown by Prütz and the today desired postage, the Dutch and Ghent at that time not yet with the balanced stance of the present-day standards. In the standards the differences in the stance of breeds are clearly defined . For the breeders the meaning will become obvious often only in direct comparison of breeds . The ideal image of a breed can be internalized only, if you know the related breeds and something about the development of the breed . For the judges, the problem exists that a pigeon should show in the desired pose in the short period of the evaluation, what they do not always do . If one stays long time before the cages, we see that some pigeons almost permanent show the desired stance, while others only exceptionally, if at all. 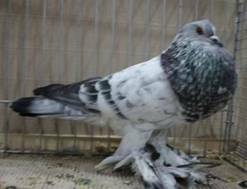 The figure and possibly faulty posture are hereditary, which is also well known from breeders of other pigeon groups, at least from the top breeders. Fanciers who can constantly monitor their animals in the breeding facility, have better ways of judging as a judge at the shows and that advantage should also be used for selecting stock birds. Fig. 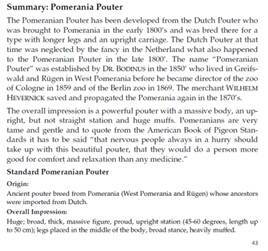 8: English language summary of the Chapter on Pomeranian Pouters from the book Pomeranian Pigeon Breeds, 2010. 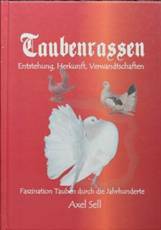 Fliedner, Dieter M. (2012), Die Gestalt der Taube. 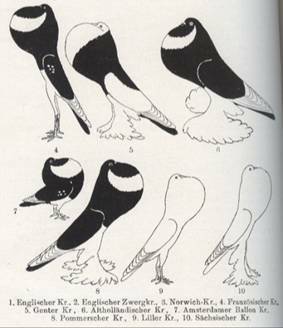 The Artist's Guide to Pigeon Anatomy, Ilmenau German and English language. Lavalle, A. und M. Lietze (eds.) (1905), Die Taubenrassen, Berlin. Prütz, Gustav (1885), Illustriertes Mustertaubenbuch, Hamburg, no year (1885). Prütz, Gustav (1904), Die Arten der Kropftauben, Berlin, no year, 1904 date of the preface. Sell, Axel (2015), Genetik der Taubenfärbungen, Achim. Sell, Axel (2009), Taubenrassen. Entstehung, Herkunft, Verwandtschaften. Faszination Tauben über die Jahrhunderte, Achim, German language. Sell, Axel (2010), Pommersche Taubenrassen. Naturdenkmale aus Pommern. 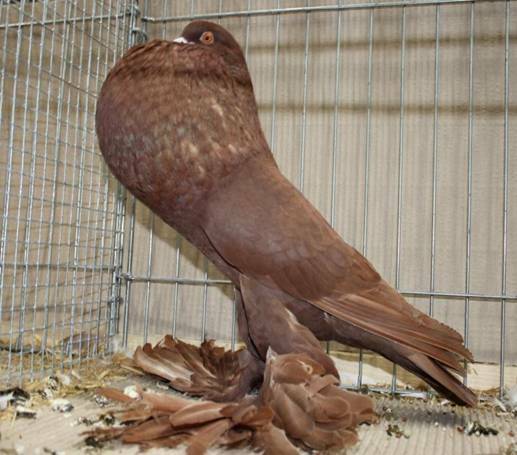 Pigeon Breeds from Pomerania. German language with English summary for every Chapter. Wittig, O., ed. (1925), Mustertaubenbuch. Berlin.